J. Crew Timex “Military” Watch Discontinued? – I Already Have a Watch. Also interesting is that J. Crew now offers a “kid’s” version of the military Timex, which seems identical to the regular Timex I recommend below as an alternative but at 2x the price. Hah. During a discussion with a friend last night about the J. Crew Timex “Military” Watch, I happened to browse to the J. Crew page hoping to point it out. 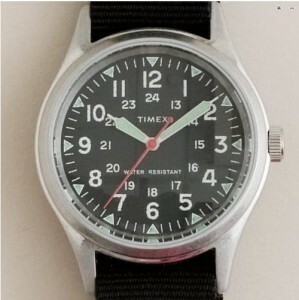 However, I noticed that at the time of writing it seems that the “Military” Timex has been removed from the J. Crew website. Some descriptions for the J. Crew replica G10/”NATO” straps still refer to the Timex, but otherwise it seems to have vanished from the site. It’s too bad in a sense. I was pretty critical of some of what I perceived as design errors (faux distressing on the dial — still can’t fathom that one). And I probably wasn’t ever going to be one to spend the $150 J. Crew wanted for what was otherwise a mostly unremarkable quartz watch. But I’m still a little saddened as I did admire the intent to look back to vintage roots for design inspiration, even if I didn’t admire J. Crew’s execution and presentation as much. One starts to wonder as well what if anything J. Crew has up their sleeve in the way of a replacement for the “circa 2009” season as well. It’s quite conceivable they might follow up with a new model, as despite my criticisms it was nonetheless quite a hit in some circles. With a little more concentration devoted to the design and a little less goofiness in the presentation, they might well be capable of coming up with something really interesting and noteworthy this time as even their last effort was firly close in some ways. 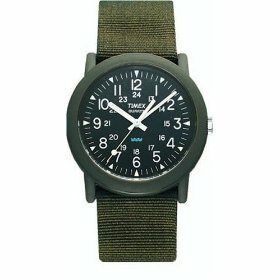 In the meantime, admirers might want to look at something like the Timex Quartz Camper Watch – Olive Drab . It’s not official issue or anything either but has a similar aesthete. It is sometimes used by military wearers for some of the same reasons though: it’s cheap, reliable, available, and adequate. And priced less than $25, it’s about 1/6 the cost of the J. Crew version. Tagged with J. Crew, quartz, Straps, timex.